When it comes to natural stone on honeycomb composite panels, please remember that not all panels are made the same. StonePly panels are backed with aluminum honeycomb between two continuous sheets of aluminum. Our competitor uses plastic (epoxy coated fiberglass) skins over honeycomb. Why do we use the more expensive aluminum (and yet still offer better pricing)? Aluminum has a long and proven history in everything from window frames for skyscrapers to frames and wings for airplanes, etc. Aluminum offers exceptional corrosion resistance, flame resistance, does not become brittle with age and is unaffected by sunlight. The competitions plastic backing must be protected from the sunlight and from flame and offers a much weaker connection point. With both systems, the bond of the stone to the honeycomb panel exceeds the strength of the stone. This means that under tension, the natural stone actually splits apart before the adhesive bond breaks. Since it is a natural material, the stone strength varies from around 220psi for marbles to around 330psi for granites. The real test of the assembled panel strength is the connection of the honeycomb panel to the structure in the field. In testing, StonePly offered 5 times the fastener pull out strength of the competition. StonePly also allows you to use screw fasteners anywhere on the back of the panel. Simply screw on the Z clip or tab and hang. The competitions connection requires either factory installed T-nuts (which makes them unforgiving of site variations) or field applied t-nut inserts set in wet epoxy. These field epoxied inserts are messy, slow and subject to field cure and quality variations. The wet set epoxy inserts slow the install as they cure overnight. At StonePly, we have a streamlined, lean and fast production system. Experience shows that on average, StonePly produces and supplies panels to your job site twice as fast as our competitor. Saving up to two months on the schedule are common. On fast track projects or when additional panels are needed this can be an enormous benefit. StonePly panels have a tested and proven screw attachment system that allows attachment of z clips to the back of the panel in seconds. Our competitor requires epoxy set T nuts that require up to 24 hours to set. Imagine the productivity, install quality and space requirements differences between the systems. Ours anchors install in 2 seconds, theirs can take up to 24 hours. Our anchors can be installed rain or shine, theirs requires dry weather. Ours installs at any temperature, theirs requires warm weather. Our panels go from the crate to the wall. Theirs requires an area to lay out panels for drilling, mixing epoxy and the epoxy cure time. StonePly offers over 250,000 square feet of production space; no one offers faster service or greater production capacity for any size project. StonePly offers design, petrology, engineering and installation assistance. We offer assistance from our in house architects, engineers, 30+ year veterans of the stone industry and CAD/CNC specialists. StonePly is part of the Stromberg Group. 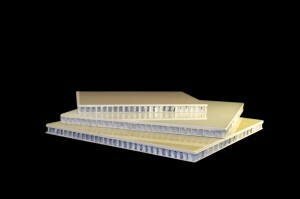 For over 30 years the leaders in composite architectural products. Clients and Commissions include leading architects, government agencies and corporations. A brief list of satisfied customers includes The Atlantis Resort, The U.S. Nuclear Regulatory Agency, The US Capitol, Tommy Hilfiger Stores, The University of California, Caesars Palace, Entergy and the list goes on. For more information about StonePly panels you can contact us at 903-454-4630. We look forward to hearing from you!